What should school CPD focus on? The most important thing in a school is that the children behave. Managing behaviour should be returned to again and again to ensure all teachers have clarity, and that the systems are applied consistently by all. It is also worth thinking about when behaviour slips – is it in the canteen, at the beginnings of lessons, during the fire drill – and addressing those specific moments with a new approach. Children read in every single lesson, but it’s not always obvious how to get them to the point where they will read aloud confidently. Children write in every single lesson, but is their writing always accurate and coherent? There are lots of small tweaks we can make to out practise to help children write more effectively. I think questioning is the absolute most important thing a teacher can do. The best teachers I have seen pepper their explanations with multiple questions asked of as many students as possible to check they understand, and then to see if the students can apply their understanding to new scenarios and begin to think more deeply about the content. Subject departments should be talking in their CPD time about the best way to explain tricky concepts, and thinking about the common misconceptions children have. Rather than using Powerpoints or photocopying multiple sheets, departments should focus on pre-producing booklets and then planning how to deliver them. Those responsible for resourcing should be trained in the best and fastest way to produce booklets under the inevitable time pressures of any school. Knowledge organisers force teams to consider what they want students to learn for the long term. CPD on making them as effective and clear as possible would be helpful, especially in the early days of adopting them. Understanding the science of memory, the power of overlearning, and the simplicity of recapping prior knowledge would go a long way to helping children retain knowledge for the long term. Not all practice is as helpful as it could be. Helping teachers discern the most important skills for children to practice and then supporting them to make activities that ensure children are undertaking deliberate practice is invaluable. Rather than laboriously marking every book, teachers can give whole-class feedback. But it is not always obvious which aspects to focus on to make the feedback as effective as possible. All of the above aspects could easily be covered in short 20 or 30 minute slots, and focused on key aspects or resources, but I think that all the elements are crucial to good teaching. In terms of pedagogy, I don’t think we can do better than implementing coaching observations, as advocated in Leverage Leadership, with frequent low-stakes observations focused on one minor tweak each time to improve teaching. 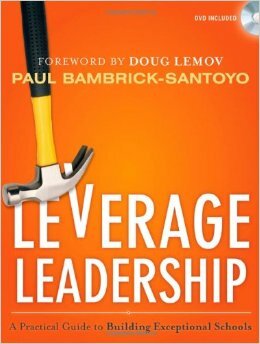 In this post I’ll be exploring just one book on school leadership. I’ve previously written on curriculum, assessment and teaching, and my next post will be on ethos. Leadership is a somewhat tricky subject, in that there are so many bad books on it. Many leadership books seem to spend an inordinate amount of time exploring semantics: what is a leader, and what is a manager? Indeed: what even is leadership? At a school level, it is simply the people who make the decisions which run the school. On that basis, the book I have chosen seems to me to be the best one out there on the mechanics of how to run – or lead – a school. Noting that: “standards are meaningless until you define how to assess them. Assessments, therefore, are the roadmap to rigour,” the author advises meeting after each assessment and “asking probing questions and deeply considering the results,” while great leaders guide this conversation “from the back pocket” – that is, keeping their “answers” in their pocket, and asking the right questions to guide people’s thinking. The greatest lesson I learned from this book was the value of weekly developmental observations, coupled with “bite-sized action steps that allow a teacher to grow.” As the author notes: “you don’t get results by placing your best teachers strategically – you get them by coaching each and every teacher to do excellent work.” Finally, an alternative to pointless graded observations, where we are not judging where teachers are currently, but coaching them to improve student learning all the time. Yet this is clearly not a blueprint we can pick up and apply to any school indiscriminately. Only those who are observant and have great listening skills will pick up on how to implement these ideas effectively for the context in which they find themselves. Not only that, it is clear to me that leadership is about vision, and it is only when you harness the belief and motivation of the whole staff body to buy into that vision do these aspects work most effectively: as Bambrick-Santoyo states, “the core principle of a staff culture turnaround is that teachers need to know the school’s core mission… and must be unified in putting it into practice.” But I am not sure it is a book that will tell you how to have a vision, or how you can inspire others to believe in it: that can only come from your own beliefs, which are often informed by experience. And if you can’t imagine what is possible, you need to see a great school in action. And, of course, if you can’t work out why all kids deserve that then it’s not a book you’re in need of. So far, this series has explored leadership, curriculum, assessment and teaching. The final post will be on school ethos.